This Australian Honeymoon: City and Beach Explorer Package was designed for a couple in their 30s from Denver. They wanted a laid-back Australian honeymoon with beautiful beaches and just the right amount of adventure. We sent them to sunny, tropical Queensland, where we knew their honeymoon would be better than they ever dreamed! We started their Australian Honeymoon: City and Beach Explorer Package in Brisbane, the lovely capital of Queensland. This under-the-radar destination has everything you could want in an Australia vacation. Their first 2 days were free to explore the city at their own pace. Their hotel had a gorgeous infinity pool overlooking the Brisbane River and South Bank Parklands—the perfect setting for romance. They also took a nighttime food tour via bicycle, winding along the river and stopping at local night markets. They loved feeling like real Aussie locals! Next, we sent them to one of the most romantic locations in Australia and even the world: the stunning Hamilton Island, located in the Whitsundays on the Great Barrier Reef. They were shuttled around on golf buggies (no cars are allowed on the island) and were blown away by the beautiful views of lush green hills, sandy beaches, and brilliant blue ocean that they saw at every turn. Of course, this Australian Honeymoon: City and Beach Explorer Package wouldn’t have been complete without a visit to the Great Barrier Reef! They spent a day snorkeling the reef with a small group, enjoying a quiet and secluded reef experience. The next day, they visited the world-famous Whitehaven Beach, where swirls of pure white sand melt into the turquoise sea, creating postcard-worthy views all around. After a week in paradise, it was time to say goodbye to Australia and head back home, with countless beautiful photographs to commemorate their getaway of a lifetime. over South Bank Parklands, the Brisbane River, and the city. Perhaps stroll through the gorgeous Roma Street Parklands along the river for a breath of fresh air. Brisbane represents the ideal Aussie lifestyle, where urban delights meet plentiful outdoor activities. You’ll feel like a true Brisbanian today as you explore the city by bicycle! Set off before dinner and head to Eat Street Markets, where you’ll find everything from aromatic international cuisines and boutique beers, to the enchanting sights and sounds of live performers. Take a beautiful, leisurely ride around the twists and turns of the Brisbane River to experience Brisbane’s best night food markets. The entire route is on bike paths with no cars or no hills. After you’ve explored the many food, drink, and entertainment options, return to Southbank Parklands via a comfortable boat cruise along the Brisbane river and witness the city come alive from a unique perspective. Today, you’re off to explore the Great Barrier Reef! Enjoy a transfer to the airport and catch your flight to Hamilton Island—an idyllic, picturesque island located in the Whitsundays, where golf buggies are the main form of transportation. Enjoy a pickup from the airport to Hamilton Island Beach Club, your home for the next 4 nights. This adults-only luxury hotel features an infinity pool overlooking the brilliant Coral Sea, as well as direct access to Catseye Beach. 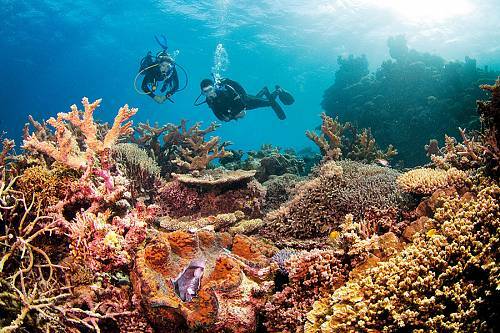 Embark on a full-day adventure on the Great Barrier Reef. You’ll visit 2 dive locations within Bait Reef and have plenty of time for guided snorkeling in this vibrant underwater ecosystem. With a maximum of 60 guests on your boat (and a capacity for 100), this tour lets you experience the one and only Great Barrier Reef away from the great crush of tourists, gaining a more intimate understanding of this natural treasure. Onboard, you’ll enjoy lounge-style seating, an air conditioned interior, partially shaded deck, and hot and cold freshwater showers. A sumptuous buffet style lunch is included, together with morning and afternoon tea. Discover one of Australia’s most romantic locales: the exclusive Whitehaven Beach. Featuring powdery white sand blending into bright turquoise waters, this sought-after destination makes for the ultimate romantic adventure! Enjoy a half-day cruise that takes you along the entire stretch of Whitehaven Beach. Land at Tongue Bay and take a short bush walk to Hill Inlet. The rest of the time is free to lounge on this gorgeous beach. Today is free to enjoy your fabulous hotel facilities. Non-motorized water sports, including snorkeling, stand-up paddle boarding, and windsurfing are included in your stay. The beautiful Catseye Beach makes a perfect place to plant yourself in the sand and enjoy a few cocktails. and the onsite restaurant offers secluded beachside dining. It’s time to say goodbye to Australia today! Perhaps rise early to catch the sunrise and enjoy one more dip in the ocean. After breakfast, you will be transferred to the airport, where you’ll fly back to Brisbane and onward back home.